The sun is going down early now, and night rides are back! Denis at the Bike Habitat has been hosting weekly rides in Ash Canyon. 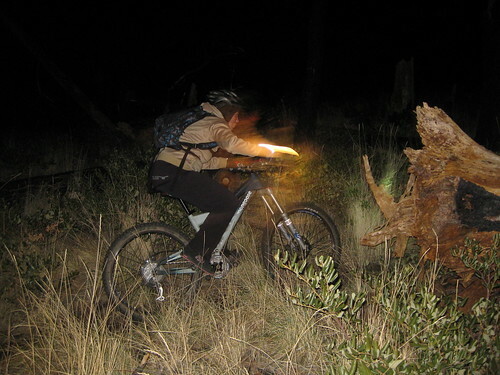 Night time mountain biking is an exciting and challenging way to experience the trails! This Thursday, 10/21, meet at 6:30 PM at the Foothill Road trailhead. New to night riding? Call the Bike Habitat at 267-5053 if you’d like to reserve a demo light! Couple quick questions for those of us that have not done night rides before. 1.) How long do the rides normally last? 2.) Any special types of clothing needed? Thanks and hope to see you guys out there next week, off to NY tomorrow. We usually go out for a couple hours…lots of socializing along the way…not constant riding. We’re doing loops, and are never too far away from the trailhead…easy to go back any time you want. It’s pretty cool up in the canyon at night this time of year. Dressing in layers is best to regulate your body temperature and not get sweaty and chilled. The rides are usually about an hour and a half. Occasionaly larger groups will split off and either shorten or lengthen the time based on rider input. Cothing is anything your comfortable in. Don’t let a lack of lights keep you from joining the fun as Dennis has some great Demos. that blue Jack LaLanne one-piece you sometimes wear looks comfy. Toby and I are gonna show up in our ToughMudder atire.